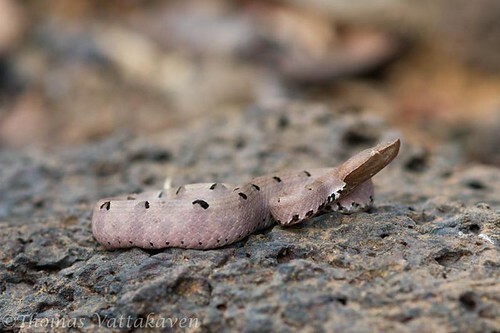 The Hump-nosed viper (Hypnale hypnale), is also known under several synonyms - Merrem's hump-nosed viper, hump-nosed pit viper, Oriental hump-nosed viper, hump-nosed pitviper, kunakatuwa (Sinhala), Churutta (Malayalam). 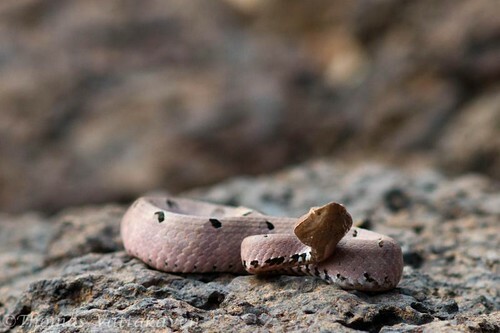 This snake is a small member of the pit-viper family and grows to just 30-45 cm in length. Pictured here is a fully grown adult snake. 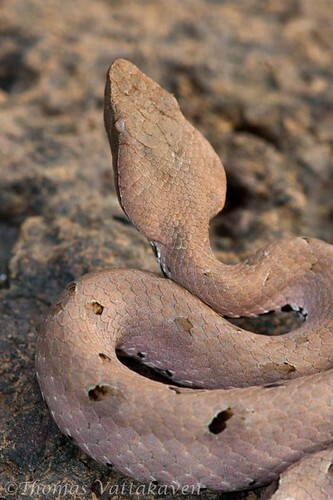 It has a distinctly triangular head and brown colouration. The snout is pointed and turned upwards and ends in a hump. 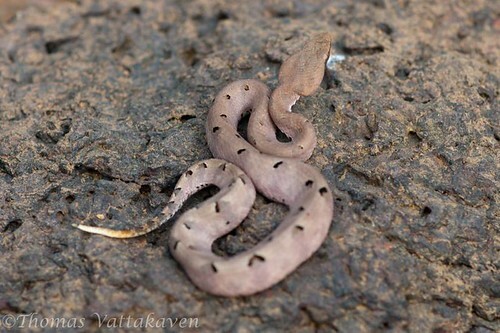 The body colouration is a brownish grey with a double row of large dark spots. The underparts are brownish or yellowish. 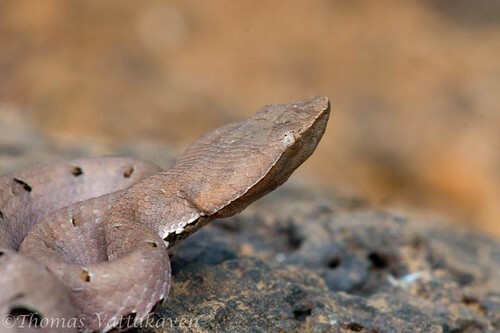 The tip of the tail is yellow or reddish. 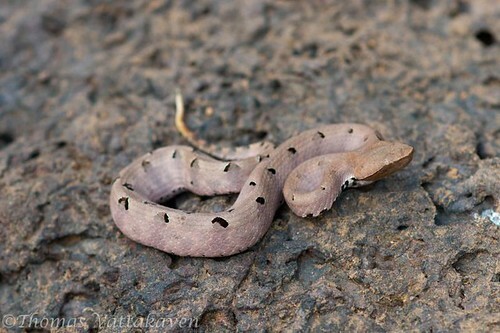 They are often found in leaf litter, tree cavities and low vegetation in forests. 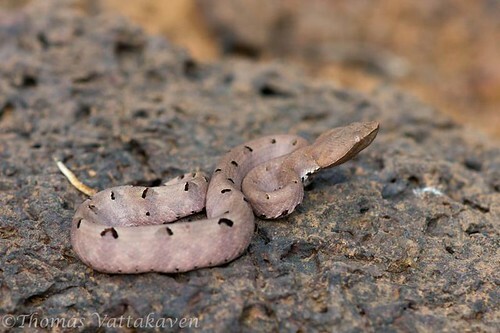 This species is restricted to south India and Sri Lanka. They are mostly diurnal, being most active during early mornings and early nights. They can commonly be seen basking in the early morning sunshine by the side of streams. It is generally sluggish but very alert when hunting or roused. It can coil back and remain in a striking pose when disturbed to deter its adversaries. However it will not hesitate to attack and is capable of fast strikes. Their usual prey includes geckos, mice, frogs and lizards. 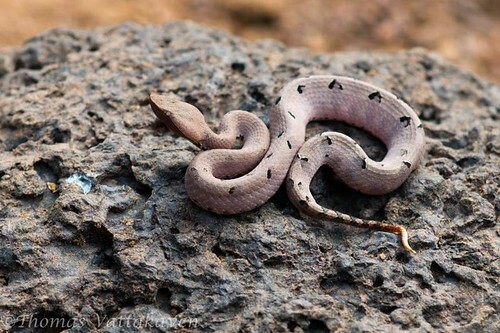 This snake is known to vibrate its tail when annoyed, much like a rattle snake. Although, the bites from this species were previously only thought to cause minor localized complications, is now known to be serious, and can lead to fatality if not treated within a few hours. 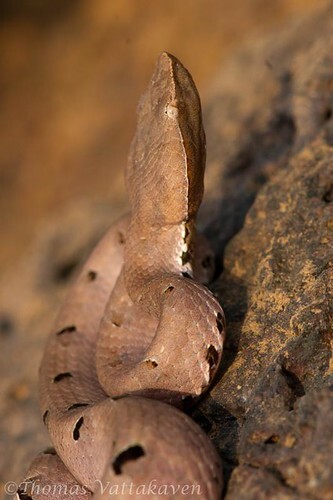 Bites are usually sustained to the hands or feet and no antivenom has been developed from the venom of this species. 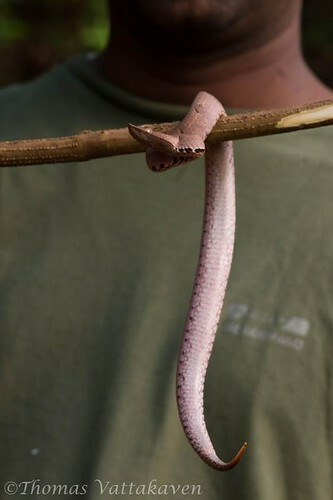 The bite of this snake may result in hemostatic dysfunction, acute kidney injury and death. 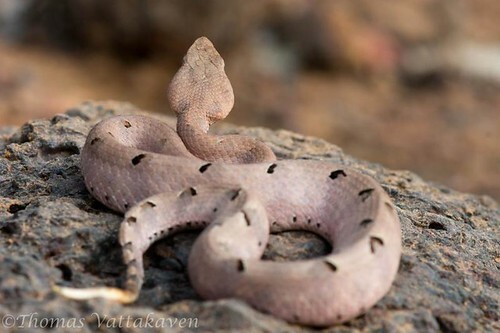 However, there are polyvalent antivenom which can be used to treat the bites. 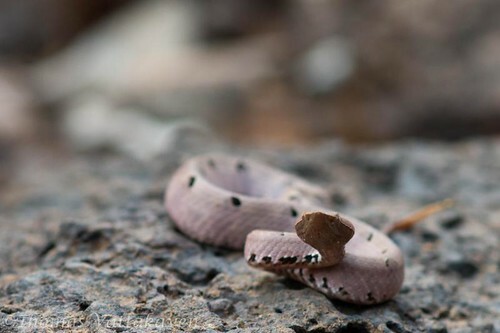 Other Details: Two individual snakes were seen, both heading away from the reservoir, probably after an early morning drink and/or sunbathing. This one was among the leaf litter, almost camouflaged, except for its movements. When handled it assumed its striking pose and maintained it for the next 10 minutes as I photographed it. Other than this, it displayed no aggression. At no point did it try to strike. After 10 minutes it started to flick its tongue out and test the air. At this point the handler put the snake back into the litter and allowed it to go on its way.